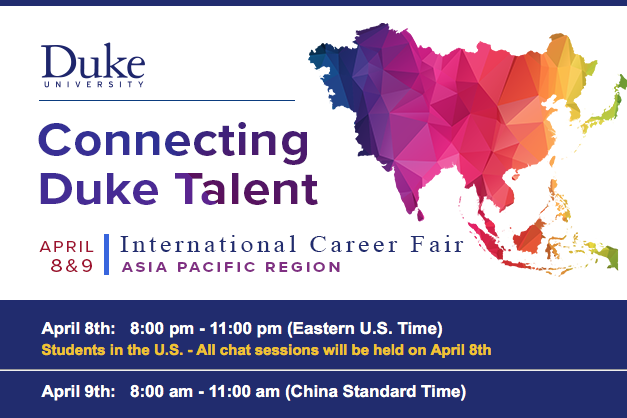 The Duke Career Center, The Fuqua School of Business, The Nicholas School of the Environment, and The Pratt School of Engineering invite you to participate in the Duke International Virtual Career Fair! This event features employers located in the Asia-Pacific region offering job and internship opportunities to Duke students. Students will visit employer chat rooms to hear more about the organizations and the positions they are offering. This is a great opportunity to connect with a range of employers in the region, some of which are Duke alumni. Check out the list of attending employers and register today by clicking More Event Information below.